I'm not really snowed in physically. It it was over 0 I would be out shoveling snow. But it's like 30 below and windy. I don't have the proper gloves for those temps and my fingers freeze off. 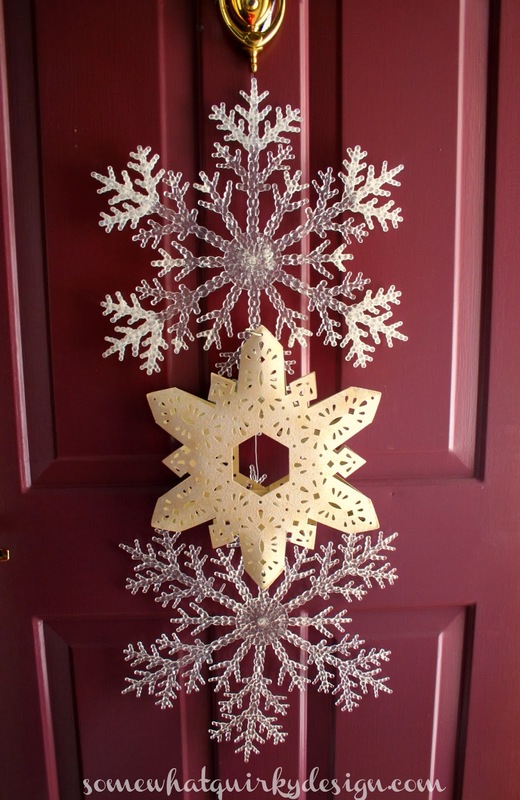 I've been wanting to take pictures of my front door decked out in snowflakes. But I don't want to take pictures in the snow. 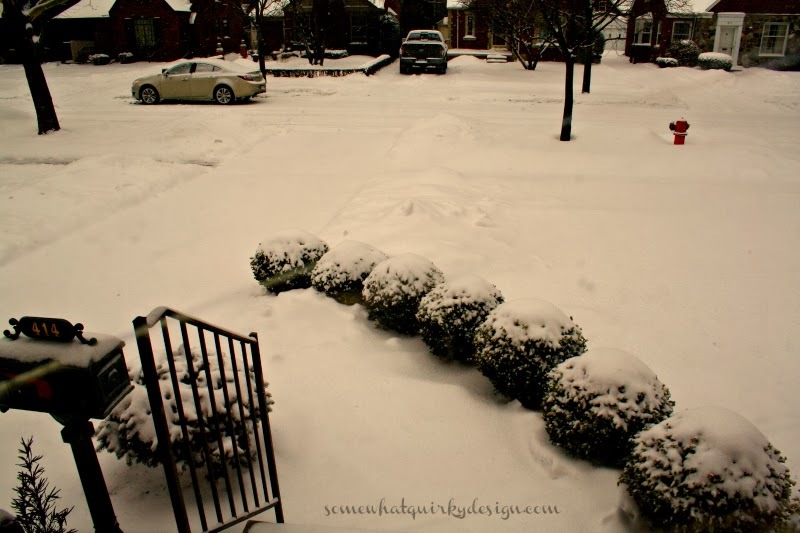 So I just opened the front door and took a few shots. Really quickly before I froze to death. I usually use these snowflakes for Christmas decor. I fear I sound gloomy. I'm trying to think of some food to make with what I've got in the house. There's some chili left over from last weekend - when I was trying to stay cheerful about being snowed in. I could make some noodles and put the chili over it???? Isn't that called Chili Mac? Maybe I will go down to the basement and do some sorting and straightening. You know it's bad when the basement seems appealing. I there a way we could skip February and March? I don't think we can afford the heating for two more months of this. Perhaps I should shut up. I've heard there are people in the U.S. that have been praying for snow. But look how pretty your street is!! It's bitter cold here in IL too. Today very cold and more snow about 2". tonight they are calling for 7" more, wow! Hubs want to move to Florida, me not so much. I love winter, it's the one time I can next and not feel guilty! 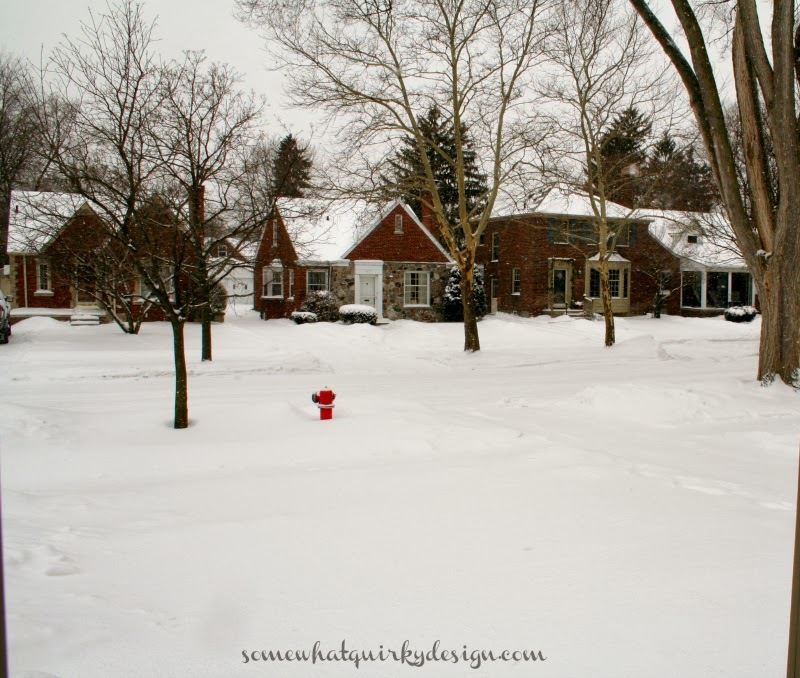 Your block does look pretty in winter. Stay warm, and head to the basement that's what I did today. yes, please shut up. I want my kids to have just one snow day this season. have fun organizing that basement and stay warm! How can anything that looks so gorgeous be so unappealing to actually live through? It looks just like Montreal in your photos Karen - I look out the window and it's so pretty and I can't take advantage of it because it's too freaking cold! Ok - on a happy note LOL - LOVE your snow flakes! Your snow pictures photos are pretty but Please, do not send any snow to Texas. The temperatures here are like a roller coaster. Was 70 deg here yesterday and now today, windy and cold with freezing temperatures for tonight and the same tomorrow and then our temperatures go back up again. Like your snowflakes hanging on your door. It was 60 here yesterday...didn't even wear my jacket. 18 this morning. Figures. Hang in there. Akin we are. Organized craft supplies yesterday, making chili tonight, and please I do not want your snow or cold, we have our own, in fact I think I sent some of it your way - sorry about that. Burr!!! I'm cold just looking at your snowy front yard. I feel for you, I really do. I can't imagine living in that cold climate. I'm hoping you have a quick thaw and an early spring.